Dr. Threinen (third from left) and eight seminary students recently received copies of The Book of Concord in Russian. It never ceases to amaze me how personally relevant theology often is for students attending seminary classes in foreign mission areas! When I began teaching courses on Early Christianity and the Survey of the Bible at the seminary in Odessa, Ukraine, I expected that a study of the Bible would personally touch the student’s lives and professor alike; it always does in many ways. But the most memorable experience for me came as we looked at the growth of the church in the Early Christianity course. Quite naturally, the topic came up of the way people became members of the Christian church in the centuries following the period of the New Testament. The topic prompted one student to tell his story. His wife came to faith after she accepted an invitation to attend worship from another young mother whom she met in a park. Merely tolerant at first, he came to faith when he saw how his wife changed following her conversion to Christianity and, as he waited for her after church. he observed how happy church people seemed in spite of really difficult times. Similar stories from other students told me this student’s story was not unique. Having come out from under Communism only twenty years ago, people are experiencing conditions much like those of the early Christians. It is simply amazing that despite having the Christian Gospel in this country for more than 1,000 years this should be the case. Reflecting on the first weeks of classes, I am gratified to note that our student body of eight men are relating to one another well. Some have a better background of knowledge and some enter into the discussions more readily than others, but judging by the diligence with which they attend to their studies, all are serious about becoming pastors in the church. For some it means being apart from their families for periods of six weeks while they attend seminary. For all it will mean facing an uncertain economic future when they are finished seminary training since SELCU congregations have not yet learned to support their pastors. I continue to appreciate the skill Pastor Oleg Schewtschenko brings to translating my lectures, and for the presence of my dear wife, Muriel. The nights are getting longer, the weather colder, coughs and colds more common, sweaters and warm jackets worn both inside and outside. And the little band of future preachers for the Synod of Evangelical Lutheran Churches in Ukraine is faced with a grim reality—the promised natural gas hook-up which was to provide heat for the new seminary building for the cold winter ahead will not materialize until spring 2011 at the earliest. Since we rely on electrical heaters for some warmth we hope the occasional power outages are few and short-lived. And we pray for a mild winter! In the midst of these difficulties, the eight students, translator and professor remain in good spirits. Our cook, Larisa, is providing a somewhat varied menu for meals. She has become a genuine house-mother, beaming as students come back for seconds of borsch and chiding a student on occasion for not finishing his plate of food. In the academic area, more gifted students help other students who struggle to understand the problems associated with the current courses: New Testament Introduction and Lutheran Confessions. Tatania, our new interpreter from Lviv, is finding it necessary to expand both her Russian and English vocabulary with the help of textbooks we use and is meeting the challenge admirably. As the instructor, I’ve have found it interesting to work with four different translations of the Book of Concord in my Lutheran Confessions course: my English Tappert translation; a Ukrainian translation; and two Russian translations, one translated from English and the other translated from the original German and Latin. Each student will receive personal copies of the Russian volumes when they arrive from Finland, but everything seems to take longer in Ukraine than back home. My personal four-month tour of duty will extend until November 28, hopefully before the snow and the subzero weather come. Rev. Dr. Norman Threinen is rector of Concordia Seminary in Odessa, Ukraine. He is a professor emeritus of Concordia Lutheran Seminary, Edmonton, Alberta. 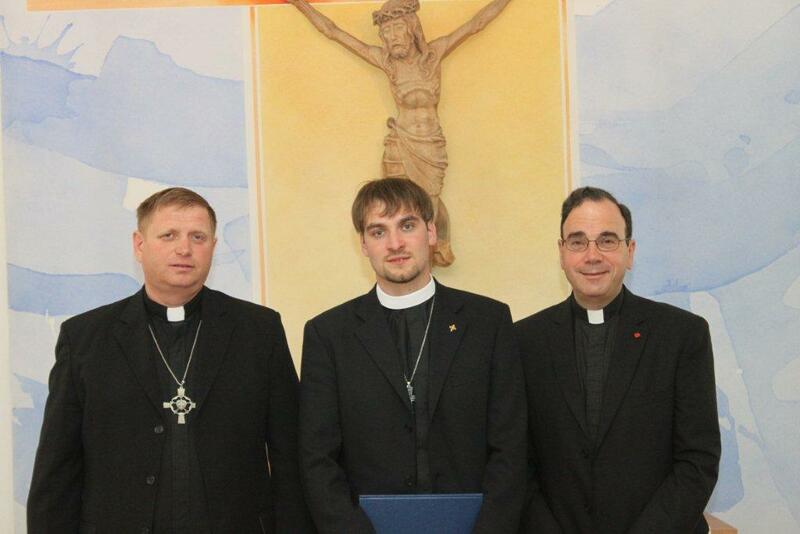 What a difference twelve years has made in the work of theological education in Ukraine! In July 1998 when I arrived in Odessa to begin seminary education it was directed largely at lay pastors who were already serving congregations; Bishop Viktor Graefenstein was the only ordained pastor in an emerging church which would become the Synod of Evangelical Lutheran Churches in Ukraine (SELCU). At that time, there were only two city congregations and two village congregations involved. Although I was received warmly, the customs and immigration process was quite scary. On forms which had no English, I had to make a precise accounting of money I was carrying; I could only guess what my answers should be! Officials searched all my luggage. And after I arrived, the first order of business was taking my passport to the police station to register my presence. In 2010 all of this is changed. Ukraine does not require a for Westerners staying less than six months. No accounting of funds under $1,000. No luggage checked. No registration with the police. There is of course a significant change in the facilities for seminary training. In 1998 the church arranged a somewhat comfortable apartment for me in Odessa, but the seminary classes were held in the village of Kamenka, an hour away. 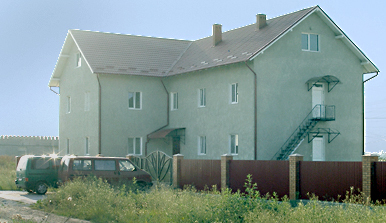 The “classroom” space was an apartment used by the small congregation in the village. It was a three-room apartment plus a kitchen but one room was stacked to the ceiling with humanitarian aid from Germany, another with sacks of flour used by the bakery the church had acquired to provide funds for the mission. The remaining room was not only where we taught, but the congregation used it for worship so there was constant assembling and re-assembling. Students sat on backless stools with make-shift desks on their laps. Ukrainian summers can be very hot and with up to ten men seated side-by-side along the whole length of the room, the atmosphere was stifling. There was no air conditioning, of course, and no fan to move the air. In contrast, now we have a substantial building which includes a faculty suite and a large classroom. Twelve years ago, students who provided transportation for me slept in the church office in Odessa. Others slept crowded in a room in the apartment block where we held the seminary classes. The new seminary building has a dormitory on the second floor which will more than accommodate the current student body of eight. Whereas twelve years ago we ate our meals in the small kitchen where everyone was wedged in, the new seminary building has a kitchen and a separate dining room. 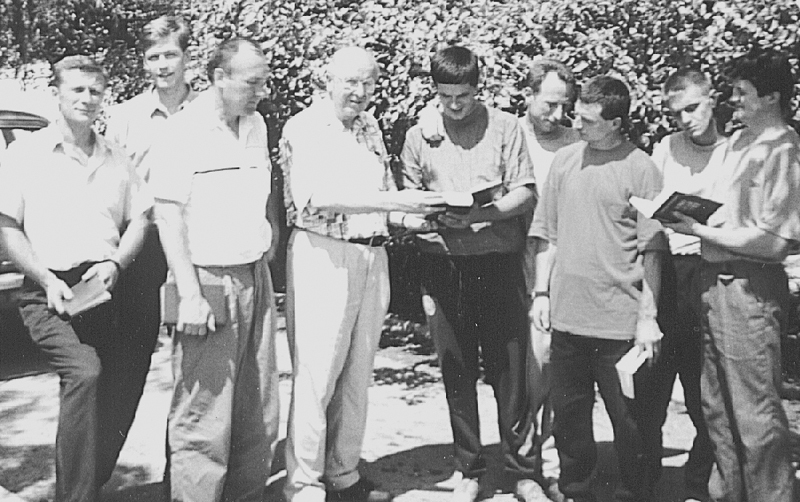 The first seminary graduates in 2001 included Oleg Schewtschenko, now pastor in Odessa (third from left); and Alexey Navrotskiy, now LCC's missionary in Ukraine (fifth from left). Also in the photograph are Dr. Leonard Harms and Dr. Norman Threinen (far left); Rev. Roland Syens (front row second from right) standing beside Bishop Victor Graefensten (front row, third from right). As far as the students are concerned, most of them in 1998 were seasoned lay leaders, some more teachable than others. In 2010, none of the students is in that category. As to being teachable, that is still to be determined. The Kamenka facilities did not have sufficient heat to accommodate classes in winter. However, the new seminary building makes it possible to run the theological program throughout the school year rather just over the summer. During summer students were tempted to pressure the professors to adjust classes to enable them to go to the sea on occasion. We also hope students will not feel the need to go home every weekend and thereby focus more on their studies. Rev. Dr. Norman Threinen is rektor of Concordia Seminary, Odessa and professor emeritus of Concordia Lutheran Seminary, Edmonton. It is Tuesday morning as I write these lines from “my” dormitory room in the new Concordia Seminary at Usatovo, Ukraine, a suburb of the great city of Odessa on the Black Sea. International guests are gradually drifting away to Norway, Sweden, Kazakhstan, Germany and Canada after the dedication festivities this past weekend. Saturday was the big day. There is no room in the new seminary building large enough to accomodate the number of worshipers expected, so the congregation of almost 175 met on the plaza facing the main portal of the building. The front steps served as chancel and preaching platform. A lengthy morning service (over 2 hours) began at 10 a.m., at which the building and its contents were dedicated to the service of the Triune God. I had the honour of serving as the first preacher on the text from Genesis 28, “This is none other than the House of God, and this is the gate of heaven.” Later LCC missionary to Ukraine, Rev. Alexey Navrotskiy, preached a second sermon. A ceremonial key was delivered to Bishop Viktor Graefenstein, who conducted the Rite of Dedication. Greetings were brought by international guests in attendance. In the early afternoon the many guests sat down at picnic tables on the grounds and ate dinner consisting of meat balls, potatoes, cold salads, Ukrainian bread, and sweets. A second service commenced at 5 p.m., at which seminary president Dr. Norman Threinen was formally installed into office and also served as the primary preacher. Bishop Graefenstein followed this up again with an additional sermon. This service was the formal opening of the seminary session, where classes will start September 1. The young men who will constitute the incoming class presented themselves at the stage and were accepted into the school by Word and prayer. Among the congratulatory messages read in the evening service were letters from longtime LCC missionary to Ukraine, Rev. Roland Syens of Kitchener, Ontario, from Terry Goerz, president of the Concordia Lutheran Mission Society, and from LCC President Emeritus Edwin Lehman. Bishop Graefenstein concluded by telling the very strange and wondrous way in which President Lehman had established the first contacts between the Canadian and Ukrainian churches back in the mid- 1990s. On Sunday at Noon, the local Odessa congregation began a communion service which included the installation of Rev. Oleg Schewtschenko, known to many LCC people from his three-year stay at Concordia Seminary in St. Catharines. Pastor Navrotskiy, Bishop Graefenstein and I all served as preachers for the occasion. After the installation rite, a very poised Pastor Schewtschenko presided over the communion service for the 90 worshippers. We did not leave the chapel until almost 3 p.m.
At long last, the building is done (well, except for a few “touches” here and there). It has been a long wait. Now the real building will begin. As the farm fields around Odessa are yielding mountains of tomatoes, cucumbers and watermelons right now, we trust the Lord to bring forth a rich harvest of faith and love from the Word seed which will be planted in the classrooms of this wonderful new facility. What a joy to be here! Having suffered through many hot Ukrainian summers in cramped quarters, I was looking forward to teaching in the spacious new seminary and mission centre as I left home August 2. The new facility is in Usatowa, a suburb of Odessa. On my arrival, I noted that a great deal of work was still needed in preparation for the dedication. The three paid workers from Western Ukraine were busy painting walls and doing cement work. About a dozen volunteers from various congregations of the church were installing door frames and generally readying the grounds. We expect about 200 guests and visitors from Canada, Germany and Ukraine will attend the building’s dedication and the opening of the seminary August 21. Although classes will not begin until September 1, my early arrival give me the opportunity to become acclimated and to interview and orient prospective students, develop budgets and buy a few books for the library. A week after my arrival, I moved into the two-room suite for instructors which, thankfully, is air-conditioned. I was happy to have my wife Muriel join me August 13 to give a woman’s touch to make the suite more hospitable for future instructors. It was helpful that Rev. 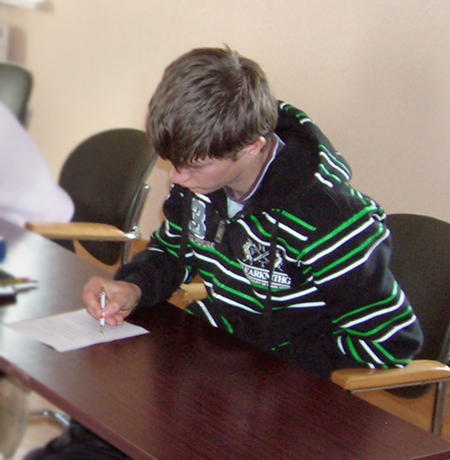 Oleg Schewtschenko preceded me by a few days and occupied an unused student room in the building. He will be installed as a co-pastor with Bishop Graefenstein of the Odessa congregation on August 22. He has also consented to serve as my interpreter for the first round of courses when classes begin. There is a strong indication that the long-expected gas hook-up for the building will become a reality in September. The neighbour from whom the gas connection needs to come is now anxious to proceed and the political barriers have also been overcome. We still don’t know the cost since much of the work to bring the gas line to the building must be done manually. Since finances have been stretched to the limit to finish the interior of the building and to equip it to a basic level for use, completion of this aspect of the project will be a great relief. Rev. Dr. Norman Threinen, is rektor of Concordia Seminary, Odessa and professor emeritus of Concordia Lutheran Seminary, Edmonton. After the Synod of Evangelical Lutheran Churches (SELCU) held its convention January 8-9 and I visitedNikolayev, I went south to the Crimean Peninsula, preaching in Armyansk on Saturday (a new mission start) and in the Black Sea resort town of Yalta on Sunday. Monday we took a long train trip northward to Dnepropetrovsk to visit extensively with LCC Missionary Aleksey Navrotskiy. On Tuesday I lectured about 50 students at the “Alpha and Omega Student Society” about hearing God’s call to leadership and fulltime service in the ministry. Wednesday I preached a Christmas season message (here in eastern Europe it’s still Christmas) on a Dnepropetrovsk television station and also for an evening service at the new Lutheran congregation served by Missionary Navrotskiy. Thursday I went to the town of Zariya and was given a formal ceremonial Ukrainian greeting by two girls in the school auditorium, dressed in folk costumes, presenting me with the traditional welcoming gift of a round loaf of bread topped with salt. We then proceeded to a private home in Zariya for an evening Bible class, which was held by candlelight because hydro went out! Two rooms in the home were jammed full of listeners. Thursday midnight Pastor Navrotskiy, seminarian Oleg Schewtschenko and I boarded a night train with sleeping compartments and rode eight hours, arriving in Kiev by breakfast. We left Kiev very early—5:30 a.m.—Saturday for our return flights to Frankfurt, Toronto and Winnipeg. I will look forward to reporting on everything in detail in The Canadian Lutheran soon. This has been a fruitful trip. It educated me well in the details of our mission enterprises in Ukraine, and helps me understand how we can help these treasured ministry partners. I write this from Nikolayev, a city of 600,000 people in southern Ukraine. The Synod of Evangelical Lutheran Churches in Ukraine (SELCU) held the first day of its annual convention today, Thursday, January 8. Pastors and delegates from all but one of the congregations attended. Bishop Viktor Gräfenstein greeted the gathering and spoke of the big decisions requiring discussion over the next two days. The conference was run on a more formal schedule, similar to the one seen by Bishop Gräfenstein at Lutheran Church–Canada’s convention last June in Winnipeg. I was invited to bring formal greetings on behalf of LCC and presented a pectoral cross to the Bishop from our Synod. In addition, pictures of LCC’s national office staff were shared with all delegates, since the staff prays regularly for the work in Ukraine. I have preached no less than five times in the first six days of my visit here. At a service on Sunday, January 4, the congregation at Odessa decided to direct its Sunday offering to the work of LCC, and the funds from this offering have already been transmitted to me. Among the problems here is the worldwide financial crisis, which, according to some estimates, may result in 70 percent unemployment in Ukraine before long. One delegate from a rural congregation reported that there are absolutely no jobs available in his village. This weekend my travels take me to Yalta on the Black Sea. I then continue to Dnepropetrovsk to spend time with LCC missionary Pastor Aleksey Navrotskiy. You are currently browsing the archives for the Ukraine category.